I read this article and found it very interesting, thought it might be something for you. 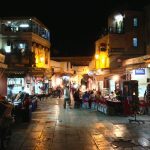 The article is called 7 Nightlife Scenes to Enjoy in Fez and is located at http://trip-n-travel.com/listicle/21592/. Fez is listed as a World Heritage Site, and is believed to be one of the world’s largest car-free zones, making it very safe for foot-access tourists. Nightlife here, however, is a little different from many parts of the world. Being a conservative Muslim country, most nightlife revolves around family activities and a distinct lack of alcohol (since Islam forbids it). Learn to appreciate this more conservative way of celebrating the night at the seven places listed below! Decor and ambiance is definitely a huge pull to come into the Bar Lounge l’Alcazar. Alcoholic drinks and non-alcoholic drinks can all be served up to you poolside if is your desire. Stay in the hotel if you have not already found accommodation, and prepare to be pampered with the entire luxury Fez experience! Cafe Clock offers food throughout the day, even covering specials like a Camel burger! On weekends, however, is when the real action happens. Pop in throughout the day, they hold special events from time to time, or come in during the evenings, when it really gets busy, and meet locals and tourists alike to talk and laugh your night away! Right above Hotel Sahrai rests The Rooftop, a chic, elegant, open-air setting to relax the evening away. Various DJ sets grace this gorgeous place, and a clear, starlit sky is not uncommon here. 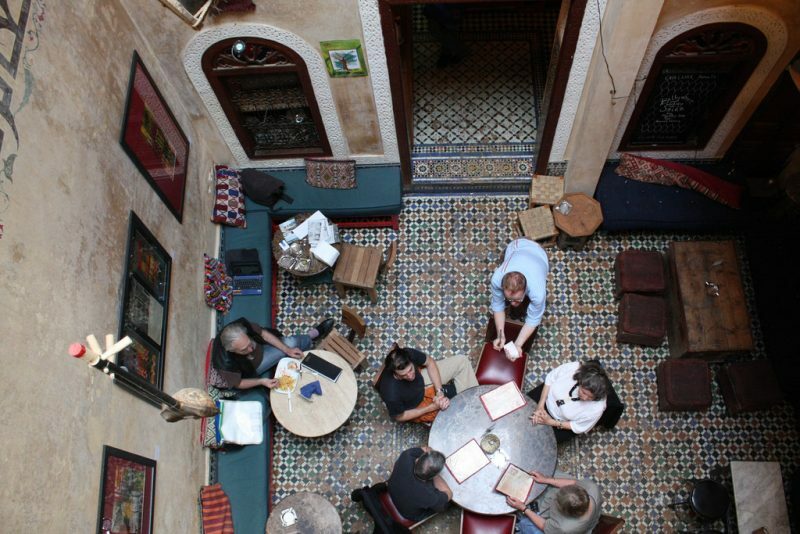 Cocktails are expertly mixed here, as are non-alcoholic beverages, and a night at the Rooftop is definitely not to be missed, for both locals and tourists alike, on a trip to Fez. Dine at the highly-rated L’Amandier Palais Faraj Restaurant in the same building before heading upstairs to Le Golden Bar to finish the night off. Not many places in the Medina offer air-conditioning so this is definitely a treat. The views from both the restaurant and bar are phenomenal and cover almost the entire city, so to be able to ‘wine and dine’ in a place like this will stick in your memory for a long time to come. One of the few standalone bars/pubs, La Mezzanine has made a name for itself for all the right reasons. Beers, smoothies and casual bites can all be found at this vibrant spot. Live music and occasional DJ sets can be found inside the premises, while the outside terrace has comfortable seats to sit back and wind down. A breath of fresh air in an old city, Restaurant Numero 7 is well-known by locals and tourists alike for serving up unique food using local ingredients. Set a time and date and give this restaurant a go; the experience is unlike no other in the city. While they are not open as late as some other places, the drinks served at this restaurant are refreshing and a treat for the tastebuds! 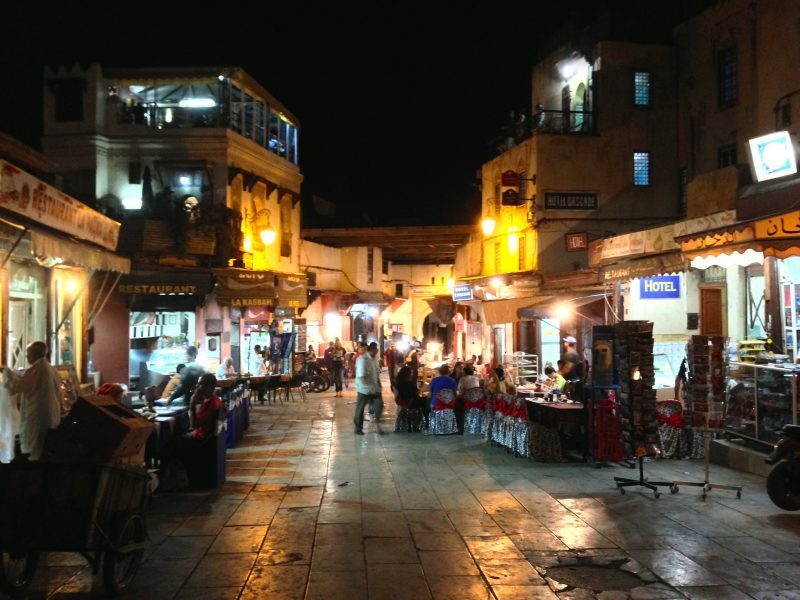 This is the one true “nightlife spot” in Fez. If you are looking to party, drop into Felix Nightclub. Again located at a hotel, this spot attracts a younger crowd who are looking to dance deep into the night. It does also have a lounge area for whoever needs a break/a quiet moment, making it quite a well-rounded good time! Fez may be a Muslim country, but do not let that stop you having a good time! Alcohol is not found as widely as many other parts of the world, so be sure to adjust your expectations before exploring into the night! These places listed are quite secure, so be safe and have fun!